Leslie Basham: Nancy Leigh DeMoss invites you into true rest. Nancy Leigh DeMoss: It’s not through our works, our effort, our striving, our righteousness. We experience the rest that God intends for us in our Christian lives today by faith in Christ. Leslie: This is Revive Our Hearts with Nancy Leigh DeMoss for Friday, August 29. In a busy world, rest is a valued commodity. Vacation planners and drug companies promise to give you rest, but is it really something you can buy? Nancy will take you to the true source in the series "Lessons from the Life of Joshua (Part 3): Trusting God for the Promised Land." Nancy: We spent quite a bit of time in Numbers 13 and 14 talking about issues of faith and fear. I think it’s important that we take a close look at this passage because it is such an important picture when we come to the New Testament of what God intends for us as New Testament believers moving into His promised rest. So before we leave this account and move on with the life of Joshua (and one of these days we are going to get to the book of Joshua), I want us to take a look first at a passage in the New Testament, an important passage that hearkens back to this incident we’ve been talking about where the Children of Israel were at Kadesh-barnea and sent the spies into the land, and the spies came back, ten with a bad report, two with a good report. The people went with fear rather than faith, and only the two who believed God, Joshua and Caleb, were allowed to go into the land. When we come to the New Testament, let me ask you to turn in your Bibles to the book of Hebrews, chapter 3. This is one of a number of other biblical passages that addresses this event at Kadesh-barnea. The writer of the Hebrews uses the experience of the Israelites there on the verge of the Promised Land to make some specific applications to New Testament believers. I had not intended to get into this passage in Hebrews chapters 3 and 4, but as I was preparing last night, I thought, You can't teach Numbers 13 and 14 without at least referencing Hebrews 3 and 4, because it is such an important New Testament passage. Some day I hope to develop this passage more fully in another series, so we are just going to skim across the surface of it. I want you to see the connection between the Hebrews passage and what we've been looking at in Numbers 13 and 14. If you've not been following along with us in this series, you may want to go back and read Numbers 13 and 14 and listen to the last several days of the program so that you can know the account, the story, that the writer of Hebrews is referencing. Of course, the people who read the book of Hebrews there in the first century A.D. would have been very familiar with the story of how the spies went into the land and came back, and because of the unbelief of the people, they had to wander in the wilderness for forty years until all of that adult generation was killed off. That’s a lot of funerals a day to bury more than a million adults in the course of forty years, and many, many of them came to untimely and premature deaths. So this was a warning in the Old Testament. The Children of Israel knew that. The New Testament believers knew that, and so knowing this story, the writer to the Hebrews hearkens back to that. Let me pick up beginning in verse 7 of Hebrews, chapter 3: "Therefore, as the Holy Spirit says . . ." Then in the rest of this verse and through verse 11, the author quotes from Psalm 95, and you’ll see verses from Psalm 95 which also talk about the Jews failing to go into the Promised Land. You’ll see quotes from Psalm 95 all through Hebrews 3 and 4, so you can cross-reference Numbers 13 and 14, Psalm 95, and Hebrews 3 and 4. "As the Holy Spirit says . . ." This, by the way, is an indication that the Old Testament, like the New, is inspired as the Word of God. It is the Word of God. The Holy Spirit says, "Today, if you hear his voice, do not harden your hearts as in the rebellion, on the day of testing in the wilderness, where your fathers put me to the test and saw my works for forty years. Therefore I was provoked with that generation, and said, 'They always go astray in their heart; they have not known my ways. As I swore in my wrath, [God says] they shall not enter My rest’” (Heb. 3:7–11). You might want to highlight repeated words in a passage. That means that that word is important in that passage. You might want to highlight, circle, underline, or put a square around the word rest. That word is going to occur twelve times in the rest of chapter 3 and chapter 4. It’s an important word. It’s something God wanted for His people. It’s something that Canaan, the Promised Land, symbolized. God wanted to take them to a place of rest, but they did not enter into God’s rest because God was angry with them because of their unbelief. Canaan was the earthly rest that God promised to His people, the nation of Israel, but the Children of Israel—they’re right at the border. They came right up to Canaan, after going through Egypt, after going through the Red Sea, after going to Sinai; they came right up to the border. The next step was supposed to be, “Go into the land,” and instead they hardened their hearts. They rebelled against God. They tested God. They failed to believe Him, and as a result, the whole generation perished in the wilderness and was prohibited from entering God’s rest. It’s a very sad story if you stop and think about it. The only thing that maybe is sadder is how many people today come right up to the edge of entering into freedom and fullness and fruitfulness in Christ, and then their hearts are hardened. They look at the giants. They look at their circumstances. They quiver in fear, and they say, “We’re not going forward. We’re not believing God.” That’s what we want to see in this passage. The writer of Hebrews hearkens back to this Old Testament scene where the Children of Israel failed to enter God’s rest that He had promised to them because they wouldn’t believe Him. So you’re reading this, and you’re saying, “Okay, that happened in the Old Testament, so what? What does that mean for us?” What did it mean for the believers, the Jewish believers, reading this passage in the first century after Christ? Verse 12 begins to give the “so what” for us. Verse 12: “Take care, brothers, lest there be in any of you an evil, unbelieving heart.” What happened to those Jews in the Old Testament centuries earlier? They failed to believe God, and God said that was an evil heart of unbelief because when they failed to believe, they actually despised Me, they actually rebelled against My Word. They would not go into the land and take it. It was not just fear. We tend to talk about fear as if that’s something that’s understandable. If somebody is trying to break into your house, you’re afraid. Of course you would be afraid. There’s something to be fearful of. But what happens is fear often takes us down a road where we get paralyzed, and we refuse to move forward in faith. Then that fear becomes rebellion; it becomes disobedience, and it keeps us from being able to experience the rest God has for us. So He says just as those Children of Israel did not experience God’s rest because of their unbelief, you watch out. This is not a story just for them. Paul tells us in Corinthians that the things that were written in the Old Testament were written for us, for our admonition, for our example. As we read through this passage, I want you to note the connection between unbelief, rebellion, and disobedience. You see those three things put together. Where there is one, there is likely the other. So we see in verse 8: “Do not harden your hearts as in the rebellion.” And then verse 12: “Take care . . . lest there be in any of you an evil, unbelieving heart.” You’re going to see unbelief, rebellion, and disobedience linked together. Verse 13: “But exhort one another every day.” How often do you and I need to be challenged by the body of Christ to be careful about not falling into unbelief? How often? Every day. How long does it take for any of us potentially to develop an evil heart of unbelief? I think the implication is less than twenty-four hours. It can happen in less than twenty-four hours. You are going along believing God and all of a sudden a circumstance comes up and fear kicks in and your heart gets hardened. All of a sudden you are going, "No! No further. I'm not going there." Unbelief is sin. It is rebellion against God, and we need to keep pulling each other back to a place of faith. We need to keep reminding each other of the promises of God, the heart of God, the plan of God, the presence of God. We need each other in this battle. It takes less than twenty-four hours, sometimes, for my heart to be deceived by my sinful unbelief. Sometimes I'm deceived in a sense that I don't even realise what is happening. As I shared earlier with you in this series, I had a period of long months lapsing into unbelief and resistance and rebellion against God. I knew I was miserable, but honestly, I didn't face the fact that I was in rebellion against God until someone loved me enough to say, "Could you be resisting and rebelling against God." Someone exhorted me that day, and others did along the way. God used those brothers and sisters in my life, as he continues to use them, to call me back to a place of faither.So exhort one another that none of you may be hardened by the deceitfulness of sin. Verse 14: “For we . . . share in Christ, if indeed we hold our original confidence firm to the end.” I’m not going to go at length into that part of this text except to say that you see all through these two chapters, Hebrews 3 and 4, that the evidence of genuine, saving faith is that you hold firm to Christ all the way to the finish line. That doesn’t mean there are never lapses, but it means that you persevere in faith, and you get pulled out of your unbelief back into faith. That is one of the evidences that you are a child of God. A person who stays for a long period of time without any evidence of a contrite or a repentant heart, who stays in unbelief and disobedience and rebellion, somebody who persists in rejecting God’s plan and call for their lives has no basis to be assured that he is a child of God. That’s a sober warning we see in this passage. We’ll perhaps do another series on that at another time. Verse 15: “As it is said, Today, if you hear his voice, do not harden your hearts as in the rebellion.” There’s that word again. Verse 19: “So we see that they were unable to enter [why?] because of unbelief.” You see how those words link together? It was their unbelief, their rebellion, and their disobedience that kept them wandering in the wilderness for forty years when they might have been enjoying the fruit of the Promised Land. Therefore, [having seen what happened to these Old Testament Jews, what are we to learn from this?] while the promise of entering his rest still stands, let us fear lest any of you should seem to have failed to reach it. So He says there is a promise to us. It’s not a physical, earthly promise like God gave to the Children of Israel—you’ll have this land as your Canaan rest. But there is a spiritual rest that God promises to His people, and He says, "That promise is still open. It’s still available, so be careful lest some of you should seem to fail to reach that rest." Verse 2: “For good news came to us just as to them.” That word good news is the word that is often translated “gospel.” The gospel is the good news. But this is not talking in Israelite history about just the saving gospel of Christ. It’s talking about the good news of God’s offer of rest. The good news to the Israelites in the book of Numbers was, God has Canaan rest for you. God has a Promised Land for you. These people heard that good news, and it came to us the good news that God has a promised rest just as it came to the Jews in the Old Testament. So these people heard the good news that there’s a promised rest available, but because they didn’t apply faith to that news they heard, they failed to enter the rest. They were kept out of Canaan, not because they didn't know truth, not because it wasn't offered them, but because they did not mix what they heard with faith. Merely hearing and knowing the truth—the good news of God's promised rest, the gospel of salvation through Jesus Christ, just hearing it and knowing it—does not necessarily mean we experience it. You can hear it; you can know it, and you can fail to experience it. Hearing must be mixed with what? Faith. Faith—not just knowing it, not just hearing it, but faith that acts on it; faith that steps out and takes God at His Word. I am convinced that many, many, many, if not most of our churches are loaded with people who come and worship weekend after weekend, who have heard the good news of salvation through faith in Christ, of rest that God promises to His children, but have never actually stepped into that Canaan rest because what they have heard has not been mixed with faith. They haven’t made it their own. They haven’t appropriated it. They’re not believing it. They’re not acting on it. They’re not living on it. So they’re staying in the wilderness. Since therefore it remains for some to enter it, and those who formerly received the good news failed to enter because of disobedience, again he appoints a certain day, "Today," saying through David so long afterward, in the words already quoted: "Today, if you hear his voice, do not harden your hearts” (vv. 3 & 6). Today, believe. Today, step out in faith. So then, there remains a Sabbath rest for the people of God, for whoever has entered God’s rest has also rested from his works as God did from his (v. 9). That’s a whole other subject in these two chapters that goes back to the seventh day of creation where God rested from His work, but the point is here that there is a rest available to us where we are able to cease from our own striving, our own efforts and enter by faith into the rest that God has available for us through Jesus Christ. Don’t you know that in the lives of those children, those under age twenty whose parents died in the wilderness, this was a powerful object lesson, challenging them to believe God? The rest of Canaan that we read about in the Old Testament is an earthly picture of spiritual realities, and that’s what the writer to Hebrews is trying to help us understand. As I’ve studied this passage, and commentators approach this differently, but I believe God has promised two kinds of rest, two kinds of spiritual rest, and both of these two kinds of rest are related, but both are entered into by one means. How do we enter into that rest? By faith, by faith in Christ and Christ alone. What are the two kinds of rest? The first is a future rest. That’s our ultimate, eternal salvation. It’s heaven, eternity with the Lord, an ultimate future rest that we do not experience in its fullness today. But we have the promise, and we cannot enter God’s eternal spiritual rest, heaven, can have no hope of heaven, apart from faith in Christ. The Scripture says we must cease from our own works. What does that mean? Cease trying to be righteous on your own and realize that your righteousness will never be good enough to get you into heaven. Cease from your own efforts and rest in what Christ has done for you on the cross through His death, burial, and resurrection. Rest in Christ and trust Him for your eternal salvation. So what’s he saying? Don’t harden your heart. There are those who listen to Christian radio, there are those who listen to Revive Our Hearts, they’re religious, but they’re still trusting in their own righteousness to give them eternal rest. I’m saying it won’t work. Don’t harden your heart. Don’t fail to believe the good news, the gospel you have heard about salvation through Christ and Christ alone. So when should you believe? Today. Believe in Christ. If God is speaking to your heart, say, “Yes, Lord. I believe.” Cease your struggling, your striving to be this good religious person, and say, “My faith and my hope is in Christ and Christ alone.” To that person God promises His eternal rest. Then there’s what I believe is a present rest that God also promises to us. It’s what we’ve talked about in this series as the abundant life, a life of freedom and fullness and fruitfulness in Christ. How do we enter into that rest? It’s not our ultimate rest, but it’s a rest God intends for us here, and I think this is what Canaan pictures in the Old Testament, the Promised Land. There were still battles there. It was not a place free from battles, which is why I think it cannot just talk about heaven. I know some good commentators would disagree with me on this, but I line up with those commentators who say this speaks also that, perhaps of our eternal heavenly rest, but also of the present rest that we are able to enter into today. How do we enter into that rest as children of God? The same way we enter into eternal rest in heaven. It’s through faith in Christ alone. It's not through our works, our effort, our striving, our righteousness. We experience the rest that God intends for us in our Christian life today by faith in Christ. He’s not promising us a trouble-free existence here. We all know better than that. There are giants in the land. We have to face them. We have to deal with them. This is not our final rest. It is just a taste of the eternal rest to come, and what will keep us from experiencing that rest in our Christian lives today? Unbelief, disobedience, rebellion. They were unable to enter Canaan because of unbelief. Unbelief is no small matter. It can keep you from heaven, and it can keep you from experiencing the abundant life here on this earth as a child of God. The life of rest—and isn’t that what we all want? I don’t mean a life of napping, a life of sleeping, but I mean a life of heart rest, trust, security, confidence in the Lord, peace, the ability to sleep well at night, the ability to have a clear conscience, the ability to go in with courage and faith and face the giants. That life of rest is a life of faith, faith in Christ and Christ alone. So if you’ve never placed your faith in Jesus Christ, be assured you will have no eternal rest with Him apart from saying, “Yes, Lord, I believe. I trust You for my salvation.” If you are a child of God, know that you will not experience rest here in this life, the peace, the abundance, the freedom, the fullness, the fruitfulness He wants to give you as long as you are striving in your own effort to be the person God wants you to be. It grieves me to see how many women, Christian women today are living these lives of struggling and striving and wrestling. They’re not just fighting the battles God intended. They are living in unbelief, and therefore not able to experience the rest that is available to them, available to each of us in Christ. Leslie: Nancy Leigh DeMoss has been telling you where to find rest—not the kind the world gives, but the deep peace of knowing a God you can truly trust. That helpful discussion is part of a study on Joshua who fought many battles and faced many challenges, but he also rested in God and hoped for the Promised Land. 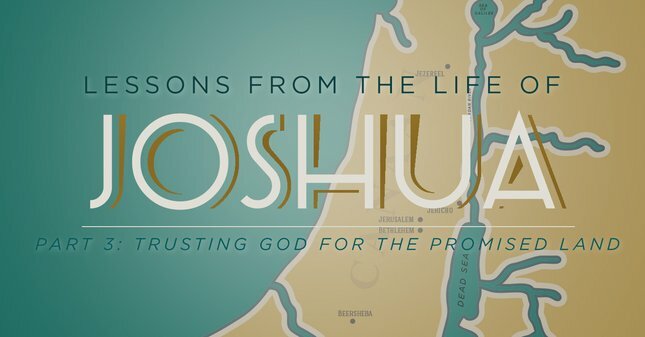 Today's lesson is from the series "Lessons from the Life of Joshua (Part 3): Trusting God for the Promised Land." During this series I've been telling you about a booklet called Promises to Live By. In it you'll find promises from the Bible. It will remind you of truths you can trust about God's protection, provision, and rest. Today’s the final day we’re making a special offer. When you support the ministry of Revive Our Hearts with a donation of any amount, we’ll send you the booklet Promises to Live By—one per household. Ask for it when you call 1–800–569–5959, or visit ReviveOurHearts.com. We’ll continue studying the life of Joshua most of next month. I hope you’ll continue during this rich study. But we’re taking a break to hear from pastor Kevin DeYoung. He shows you how to stop being “crazy busy.” Please be back for Revive Our Hearts. Nancy is back to end our time together. Nancy: Lord, I pray that You’d take these truths and apply them to our hearts. You alone know our hearts, but thank You for the rest that is ours in Christ. I pray that You would call each of us to a life of faith, a life of dependence. Deliver us and cleanse us and bring us to repentance over our unbelief, our disobedience, and our rebellion, and may we enter into Your rest by faith in Christ and Christ alone, in whose name we pray, amen.